In 1976, Lama Yeshe and Lama Zopa started the Foundation for the Preservation of the Mahayana Tradition (FPMT) which is an organization devoted to transmission of the Mahayana Buddhist tradition and values worldwide through teaching, meditation and community service. The FPMT is thriving with over 147 centers and projects worldwide. Please CLICK for further information on Lama Zopa Rinpoche. Directed, produced, filmed, written, and edited by CHRISTINA LUNDBERG. Christina Lundberg is an award winning filmmaker who brings her extensive experience making documentary films to Mystic Tibet. Her previous work includes Discovering Buddhism, a 13 part series on Tibetan Buddhism hosted by Richard Gere and Keanu Reaves, and featuring His Holiness the Dalai Lama and other great lamas. She created a 26 part television series on Buddhism for Mongolia National Television which has run for three consecutive years to over 1.5 million viewers. Other projects include a video about The Maitreya Project which is currently translated into 9 languages and the documentary, On the Road Home, about a woman’s spiritual journey and the holy female teachers who teach her along the way. 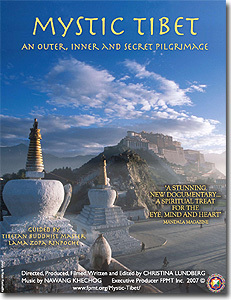 Ms. Lundberg’s depth of understanding of Tibetan Buddhism combined with her skilled filmmaking provide a strong foundation for capturing the unique and profound dimensions of this pilgrimage and the benefits of such a holy activity with such a master as Lama Zopa Rinpoche. Music by NAWANG KHECHOG and MERCEDES BAHLEDA. Grammy-nominee Nawang Khechog is an internationally-renowned flutist, and a former Tibetan Buddhist monk. Khechog has performed over a dozen times at Carnegie Hall. His unique background of religious training and musical experience produces a haunting and evocative soundtrack for a spiritually-transformative experience. Tibetan religious music is an integral component of the Buddhist culture so precious to this devout land. Mystic Tibet contains sections of traditional ceremonial music performed by the monks and nuns participating in the sacred rituals led by Lama Zopa Rinpoche and recorded directly in real time. This combination of authentic ritual music along with Nawang Khechog’s unique style deepens and expands the spiritual quality of the viewers’ experience.